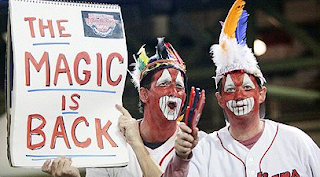 RogerBlazic.com: Cleveland Indians Have Best Record In MLB. I'm Stocking Up On Anti-Depressants. The Magic IS Back. Get down to a game. Something completely amazing is going on at a ballpark here in Cleveland. A team called the Cleveland Indians has the best record in Major League Baseball (MLB). Having spent 40 years of my life in this lakefront city before a 14 year stint in Las Vegas, I know what will eventually happen down the road, and that is why I'm stocking up on Anti-Depressants. Before the first pitch was thrown in the 2011 baseball season, the sportswriters, national sports analysts and local talk show gurus were not very hopeful for the Tribe this year. "If they can finish April at or around .500, they might not be too bad." Emphasis on - too BAD. All the pros were merely hoping that the Indians would not make a mockery of themselves and be 20 games out of first place by April 30th. But the upstart Indians managed to set a team record for wins in April, finishing 18-8. Even with the impressive record, fans were still reluctant to brave the cold and wind to head down to Progressive Field and watch the Tribe. OK... That was April. Now... what's going to happen in May? By now, reality had to set in, but no. It's May 23rd and the Indians just completed a 3-game sweep of the Cincinnati Reds, who are in second place in the National League Central Division behind the St. Louis Cardinals. The sweep puts the Tribe at 29-15, a .659 winning percentage and they're revved up to take on the Boston Red Sox tonight at home. Fans are starting to figure this thing out and turned out in droves for the weekend "Battle of Ohio" against the Reds. What the fans are being treated to is not just ho-hum baseball that results in a win. This is wildly exciting. I think they have won nearly 10 games in their last at bat. They've come from behind. They've had a triple play. There are home runs, drag bunts, stolen bases, outstanding fielding, all-star pitching and some pretty good hot dogs. But this is not good enough in Cleveland. It's like marrying a stripper. Sure, it sounds great and you enjoy her while she's hot, but she'll crush your heart down the road for any number of reasons. Cleveland fans are rabid, but also highly frustrated. Every time the finish line is within sight or even three yards away, something incredibly horrible happens, and we're left with out mouths hanging open for about two days. Everyone is so stunned they can't even talk about it. We have more monikers for disaster than hillbillies in a trailer park in "Tornado Alley." I don't even want to repeat them. They involve every sport from football to baseball to basketball to college sports to synchronized swimming. Someone always manages to grease our brass ring. Now, the specter of an Indian pitcher's arm literally falling off after a bad curve ball or our top hitter suffering a season ending injury in the on-deck circle or our shortstop being put on the 15-day disabled list for swallowing a wad of tobacco are all within our imaginations - these are not mindless thoughts. We have a sordid sports history to help conjure up even more devastating and unimaginable demises. And that's why I'm stocking up on Anti-Depressants. This year looks like it will be the most fun since the Indians made the playoffs in 2007 - but that ended in a disaster, too. Don't even make me think of the World Series appearances in the 90's. In a town where championships are measured in portions of CENTURIES, we have plenty to doubt, even though the facts tell us otherwise. If this pace keeps up into August, the whole town will be on sedatives or really, really drunk. For now, the Cleveland Indians have the best record in Major League Baseball (MLB) and I'm stocking up on Anti-Depressants - Go Tribe, please, GO!